One of the 32,744 companion animals killed by PETA in the last 13 years. In 2015, PETA killed 1,009 of the 1,286 cats they took in, a kill rate of 78%. Another 229 were transferred to kill shelters since PETA has a policy of not working with No Kill shelters. If they were killed or displaced other animals who were killed, that’s a cat death rate of 96%. The goal, after all, is not to have animals “saved” from PETA’s needles only to be given the needle down the road (or displace others who are then put to death) as that would be nothing more than a shell game, a classic case of out of the frying pan and into the fire. The goal is to actually save them by having them placed into loving, new homes–something that is not likely to happen since PETA makes very little effort to do so. 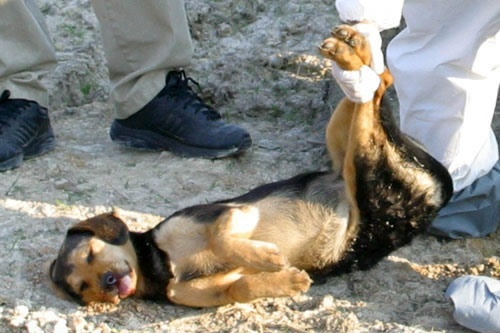 PETA also killed 447 of the 688 dogs they took in, a kill rate of 65%. Another 217 were transferred to kill shelters. If they were killed or displaced other animals who were killed, that’s a dog death rate of 97%. The adoption rate for each was only 3%. They also killed 38 of the 60 “other companion animals” they took in and sent five to kill shelters. PETA also admits that it is “referring animals” to local shelters which is actually improvement, because they will have a better chance of being saved, though not by much. At the Peninsula Regional Animal Shelter which serves the area, for example, 1,939 cats either died or were killed out of 2,970, a 65% death rate. Either way, these animals are likely to be killed. In 2015, PETA also joined a group whose express mission was to ban pit bulls and have them killed by “shelters” all over the country and it joined hunters in New York to have community cats rounded up and killed. For a copy of statistics as self-reported by PETA, click here. For 2016 statistics, click here. For 2014 statistics, click here.